- Attaching a Google Drive file to a note. To remove Timetonote from your G Suite domain, and disable data access to your G Suite domain, log in to your G Suite Admin Console find the Timetonote app and delete it. Gmail Contextual Gadgets have been deprecated by Google and will be permanently shut down on August 1, 2018. Timetonote has been translated in one more language: Czech. Thank you for the translation to our users. 1. Go to your Google Apps Admin Console, find the Timetonote application, under Marketplace apps, and delete it from your domain (you will not loose any data). Note you will need a Google Apps admin account to do this. 2. Go to the new Google Apps Marketplace, click on "Integrate with Google" and follow the steps to add Timetonote back to your domain. Timetonote's user interface has been updated recently to a new more modern look and feel. The new user interface is cleaner and more similar to Gmail's interface, something that Timetonote's users are already familiar with. The main navigation tab has been moved to the top with only the most common actions being kept as default. The rest of the actions have been moved to their corresponding pages to reduce clutter. The "Dashboard", "Contacts", "Tasks" and "Projects" pages all have now a filters column in the left side bar which enable you to easily filter the data in the lists by user, label, type or by searching. You can now scroll through all the lists while having all the navigation and filter options locked in place and still visible. Selecting one or more items in these lists will display all the options available in the bar above the lists, like apply labels, delete, merge, etc. One great new feature, included in this update, is the count number for all the contacts and projects displayed in the lists near the page navigation buttons. The contact and project pages have also been improved to the same look and feel. With more screen space being allocated to the history and tasks lists on the right side bar. Also, the "Settings" and "Account" have been moved under the user icon button on the top right corner. The Timetonote Gmail Gadget has just been updated. The new Gmail Gadget comes with a redesigned user interface, a "Save email" button and a "Save contact" button. 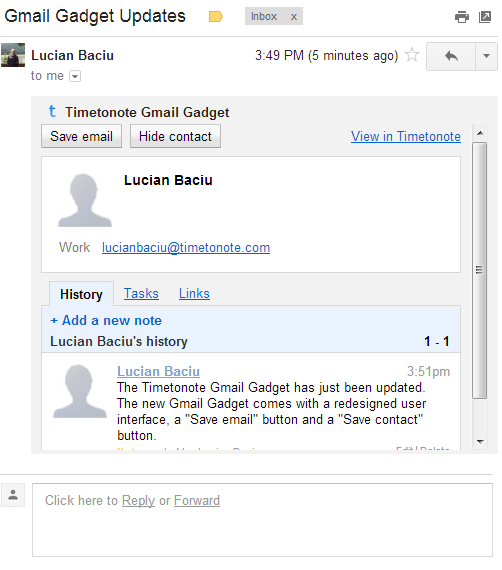 To use the Timetonote Gmail gadget you must add Timetonote to your Google Apps domain. If you have already added Timetonote to your Google Apps domain you must grant Timetonote new data access rights on your Google Apps Domain Management page. Another requirement for the new gadget is that you have IMAP enabled for your Google Apps domain users. You can read more on how to enable IMAP here. The new gadget makes it a lot easier to save emails in Timetonote. The gadget will display a "Save email" button below each email in your Google Apps Gmail account. With just a click of this button you can save the email in Timetonote. Once the email is saved, the button will disable itself and indicate that the email was saved with a "Email saved" button text. When saving an email, the gadget will read both the email sender and recipient(s), it will then search for them in Timetonote (by email address) and will link them to this email. If the contacts are not found in Timetonote, they are automatically created. The gadget will now save emails as HTML so you will now see the rich HTML email in Timetonote, and not just the plain text version. A new "Save contact" button has been added to the gadget. This button enables you to just save the contact(i.e. the email sender or recipient) in Timetonote and not the email. The gadget will initially read both the sender and the recipient of the email and will figure out which is the Timetonote user (based on your Timetonote user email address) and which is the "client". It will then search by email for the "client" contact in Timetonote. If it does not find one it will display a "Save contact" button, and if it finds one it displays a "View contact" button. The "View Contact" button will expand the Gmail Gadget with full contact details, history, tasks and links. You can also add new notes, tasks and links in the gadget expanded view. The groups management page has been moved under the "Settings" page. Every user with "Can manage groups" permission can now view, edit and delete all the groups in the account, not just the ones he/she created. Users can now share data with any group, not just the ones the user is a member of. For example, a user that is a member of the "Sales" group can now create a task and set it as visible to the "Installation" group even if the user is not a member of the "Installation" group.